Sinkholes are bowl-shaped, funnel-shaped, or vertical-sided depressions in the land surface that form over underground voids. These depressions can range from a few feet to several hundred feet in diameter, and usually result from the natural collapse of soluble bedrock and overlying soil. Sinkholes can also result from mining, groundwater pumping, and leaking water, sewer, and storm water pipes. Subsidence of the ground is usually gradual, but on occasions it can be sudden and dramatic. When it rains, a portion of the slightly acidic water percolates though the soil, comes into contact with bedrock, and slowly dissolves mineral grains. In regions of carbonate bedrock, this process can create of underground fissures and caves. The surface of such a region is often pocked with depressions called sinkholes. Sinkholes are a characteristic featuer of a karst terrain. In well-developed karst terrain, chains of sinkholes form what are known as solution valleys and streams frequently disappear underground. Sinkhole collapse, either slow or dramatic, can cause considerable damage to buildings, highways, rails, bridges, pipelines, storm drains, and sewers. In addition, sinkholes provide a pathway for surface water to directly enter groundwater aquifers. The increasing potential for pollution is particularly high due to the minimal filtering of surface water. A poor understanding of karst terrain has led to land-use practices that pose significant economic and environmental impacts to households and communities. Sinkhole formation is closely related to local hydrological conditions, and human-induced changes to the local hydrology can accelerate the process. Diverting surface water, pumping groundwater, and constructing reservoirs can all contribute to sinkhole formation. An extreme example occurred in Florida on February 25, 1998, when, during the flushing of a newly drilled irrigation well, hundreds of sinkholes up to a hundred and fifty feet across formed over a twenty-acre area within a few hours. Runaway urbanization and development dramatically increases water usage, alters drainage pathways, and overloads the ground surface. According to the Federal Emergency Management Agency, the number of human-induced sinkholes has doubled since 1930, while insurance claims for related damages has increased 1,200 % from 1987 to 1991, costing nearly $100 million. Subsidence is generally not covered by standard homeowners insurance. Virginia counties containing significant karst terrain. Modified from Virginia Natural Heritage Karst Program. In Virginia, the principal area affected by sinkholes is the Valley and Ridge province, an extensive karst terrain underlain by limestone and dolomite, but narrow marble belts in the Piedmont and some shelly beds in the Coastal Plain are also pocked with sinkholes. Dramatic collapses that swallow homes or persons have happened in Virginia, but are rare. The most notable incidents occurred in the City of Staunton: on August 11, 1910, parts of several homes and the firehouse were lost in a series of sinkholes on Baldwin Street and Central Avenue, and on October 28, 2001, a 45-feet deep chasm opened up on Lewis Street. In April of 2000, thirty-two sinkholes were reported in the upper Shenandoah Valley after seven inches of rain fell after a long dry spell. Sinkholes regularly cause problems for transportation infrastructure in the Commonwealth. During the past thirty years, VDOT has recorded approximately 500 sinkholes that have damaged roads throughout the state. In March 2001, a nine-mile stretch of Interstate 81 in Augusta County was closed after the sudden appearance of three sinkholes, the largest measuring 20 feet long, 11 feet wide and 22 feet deep. On October 5, 2004, the right southbound lane of I-81 just north of the Exit 118C ramp in Montgomery County collapsed. Due to the potential for damage to infrastructure and danger to the travelling public, VDOT maintains an emergency contract for sinkhole repair. In general, sinkhole occurrence is unpredictable and the size of a sinkhole cannot be estimated from the surface collapse, so repair costs range from the tens of thousands to the hundreds of thousands of dollars per sinkhole. Research into sinkhole distribution and early prediction is ongoing; however, a true method of early prediction remains elusive. Groundwater contamination is a common problem in populated areas overlying karst terrain. Karst aquifer contaminants in Virginia have included petroleum products, herbicides, solvents, fertilizers, sheep and cattle dip, sewage, dead livestock, and household garbage. In the late 1800s, a Shenandoah County community was subjected to a cholera outbreak due to the pollution of the local karst aquifer. A significant concern is the vulnerability of karst aquifers to contamination along the I-81 corridor, where hazardous materials are regularly transported and accidents can occur. For some chemicals that do not readily mix with water, contamination can be widespread and remain in the groundwater for many years. Most of Virginia’s karst region follows Interstate 81, and twenty-seven of Virginia’s counties lie in this zone, where hundreds of thousands of people get their drinking water from wells and springs. State law prohibits the dumping of waste into sinkholes, and some Virginia counties have implemented ordinances about sinkhole dumping and outfalls. Meanwhile, the Virginia Health Department discourages the use of karst springs as public water supplies and requires periodic testing of those karst springs that are used. The Virginia Department of Conservation and Recreation’s Natural Heritage Karst Program is responsible for groundwater and habitat protection in karst areas, supported by EPA Section 319 Clean Water Act Program. 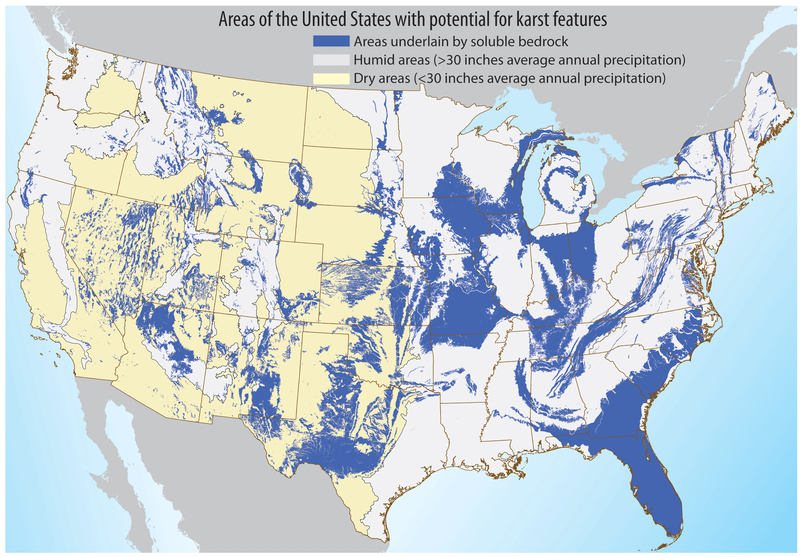 The USGS, working with various state agencies, has developed a National Karst Map. Areas over historic underground mine workings are also susceptible to subsidence. Mine collapses have resulted in losses of homes, roadways, utilities and other infrastructure. Abandoned coal mines occur in Buchanan, Dickenson, Lee, Scott, Russell, Tazewell, Wise, Montgomery, and Pulaski counties in southwest Virginia; and Henrico, Chesterfield and Goochland counties in the Richmond coal basin. Other abandoned underground mines occur throughout the state. Information of past mining activity can be obtained from the Virginia Division of Mineral Mining and Division of Mined Land Reclamation. Recently, DGMR geologists have started using high-resolution LiDAR data to map sinkhole locations and help identify geologic units prone to sinkhole collapse. LiDAR, which stands for Light Detection and Ranging, is a method of remote sensing that can produce a precise 3-dimensional model of the Earth's surface. Unlike aerial imagery like you would find on Google Earth, LiDAR can see beyond dense vegetation and forest cover to reveal the extent of sinkholes and even subtle depressions. Inventorying sinkholes can be an arduous, time-consuming task. To speed things along, geoscientists have starting using LiDAR data to attempt to automatically detect and delineate sinkholes using computer programs. Structural cracks in walls, floors, or foundations. The Virginia Department of Conservation and Natural Resources web site concerning the Virginia Natural Heritage Karst Program. References: Fosse, R. M., 1968, Surface subsidence and collapse caused by groundwater withdrawal in carbonate rock areas: Proceedings of the 23rd International Geological Congress, Prague, v. 12, p. 155-166. Hubbard, D. A., Jr., 1983, Selected karst features of the northern Valley and Ridge province, Virginia: Virginia Division of Mineral Resources, Publication 44, one sheet. Hubbard, D. A., Jr., 1988, Selected karst features of the central Valley and Ridge province, Virginia: Virginia Division of Mineral Resources, Publication 83, one sheet. Hubbard, D. A., Jr., 1999, Highways in Virginia karst: Resource and hazard considerations: 50th Annual Highway Geology Symposium & TRB Karst Meeting, Proc. & Field Trip Guide, 13-22. Hubbard, D. A., Jr., 2001, Selected karst features of the southern Valley and Ridge province, Virginia: Virginia Division of Mineral Resources, Publication 167, one sheet. Hubbard, D. A., Jr., 2003, Use of regional sinkhole mapping for sinkhole susceptibility maps, in Beck, B. F., ed., ASCE Geotechnical Special Publication No. 122, p. 61-71. Hubbard, D. A., Jr. and Sterrett, R. M., 1994, Groundwater contamination in Virginia karst: Case studies (abs. ): Program and Abstracts, 37th Annual Meeting of the Association of Engineering Geologists, Williamsburg, VA, p. 49.